Roger Author Personal Development / All Others. Have you ever watched a TED talk and thought "I want to be that guy"? 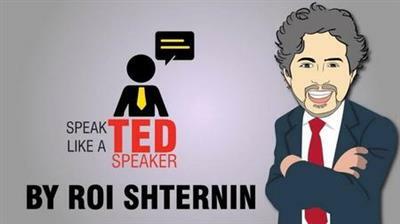 This course will teach you how to speak like a TEDx speaker! Instructed by a TEDx expert, structuring public speaking, making it easy as ABC! After training dozens of TEDx speakers, organizing several events and giving a Talk myself, Iv'e found the best way to teach you how to speak just like a TEDx speaker! Being a teacher and trainer for more than 15 years I've developed an easy public speaking system I call "The ABC's of public speaking", making public speaking a simple template based process, this course will teach you how to use it. *prepare a proper presentation for work, school or a business pitch. *Streamline your story to create an effective TED like talk. *Have a structured templates You can use again and again with any public speaking opportunity. *This course will cover several public speaking techniques bonded together to create one coherent system of preparing any presentation, with or without visual aids, scrips or a stage. *You will be given the right tools to deal with daily mishaps and technical issues common in public speaking and presentations and how to avoid them. Public Speaking Success: Be an ALL-ROUNDER using D.I.V.A.